1. Remember: it’s just a novel. It’s a great novel, and a long novel, and a Victorian novel, but that doesn’t mean you should approach it as an obstacle to be overcome, like some kind of fictional Mount Everest. Novels are for reading – Victorian novels maybe even more than most! It’s also a very funny novel, though its humor is rarely of the knee-slapping kind. Just because it’s a “classic” doesn’t mean it’s dead serious, or that you have to be. 2. Don’t rush it. It was originally published in installments: consider reading it this way, one or two books at a time, over several meetings. Every page has its share of details to savor. 3. Mark it up! You’ll want to be able to find the good bits later. I think that what actually kills a book group–or at least makes it a lot less worthwhile than it could be–is people airing unsubstantiated opinions and gesturing vaguely towards the whole book as “evidence” (or insisting “that’s just my opinion”). Talk about the actual book–the words on the page–as specifically as you can. 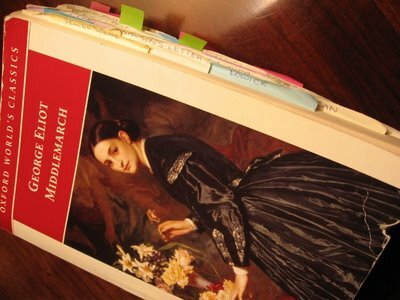 The longer the book, the more challenging that is, for sure, but you chose Middlemarch, after all. So do your best to learn your way around it, and leave yourself a helpful trail of crumbs. I’m a big fan of the Post-It for this purpose, but do what works for you. E-books allow highlighting and bookmarking; for many people, though, a paperback and a pencil in hand is all they need or want. 5. Persist! Any long book–really, any book at all–may occasionally lose its grip on you, and then you start setting it aside in favor of other things to read, and the next thing you know you’ve lost all your momentum, which in turn becomes a reason not to pick it up again. The best way out of that slump is to pick the book up, settle yourself in your most comfortable chair, and read for a solid hour until you are back in the groove. Often (though of course not always) focusing thoughtfully on a book will really improve your relationship with it: you will find the rhythm of its language, and regain your traction with its plot and characters. The external motivation of reading for your book club is good for inertia too. Needing to put a little discipline in your reading is not necessarily a sign that the book is a failure! I swear that is my copy in the photo up there, with all the curled post-its . . . the blue, the yellow. I’m sure I’ve never sent you a photo of my book. And I know you’ve never been to my house . . . so . . . how can this be? Great tips! I just joined the Harvard Book Store book club and their book is Middlemarch! I can’t wait to read it. I am starting today. Thanks!!! Oh, that’s fantastic! That is one of the best bookstores I’ve been in, too. I hope it’s a great experience.